When you’re shopping for a new mattress, it’s vital to choose the material that’s best for you. After all, the right mattress can provide you with a peaceful and comfortable night’s sleep. Also, it can help to reduce pain, inflammation and even stubborn back pain. On the other hand, sleeping on an old or unsupportive mattress can actually cause back pain and joint pain in the long term. One type of mattress that has risen hugely in popularity is the latex mattress. Lovers of latex claim that these mattresses are extremely comfortable, supportive and useful for helping back pain. However, many of us are unfamiliar with latex mattresses and the potential benefits they can offer. Can a latex mattress really help to reduce back pain? Would a latex mattress be a good choice for you? Never fear, because our team of experts at Sleep Reports have been working tirelessly to produce this handy guide with all you need to know about latex beds. 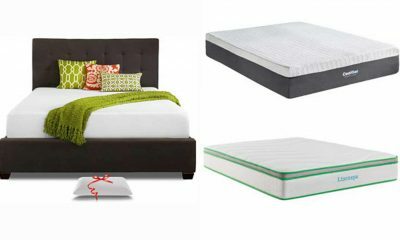 Also, we have reviewed our absolute Top 7 products to help you choose the very best latex mattress for you. In a rush? Head over to the Zenhaven Mattress by Saatva. Not only is this mattress dual sided for customisable comfort, it also sleeps cool and is great for joint and back pain sufferers. That’s why we recommend it as our expert-approved best latex mattress. Luckily, there are a range of high-quality latex mattresses on the market. Which one is best for you depends on your sleeping needs and your budget. Here are the updated reviews of the 7 best latex mattresses in 2019. This awesome latex mattress is manufactured by Saatva, a hugely well-respected mattress retailer. The Zenhaven is organic and eco-friendly, therefore it is a great choice if you want to make a mattress purchase that helps the environment.Furthermore, this mattress is created without any potentially toxic ingredients. Therefore, you can rest assured that it is perfectly healthy and safe to sleep on. 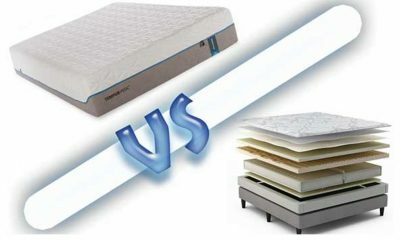 Also, the dual-sided firmness means that most users should find the Zenhaven mattress extremely comfortable. 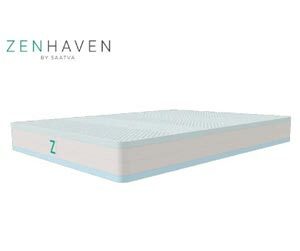 Although not the cheapest option on our list, we would expect the price to be much higher given all the premium features on the Zenhaven mattress. So, would it be a good choice for you? Dual-sided: This allows you to select between a medium or a firm mattress by simply flipping it over. This is a stand-out feature, and it is surprising to see it on a mattress of this price. Therefore, this mattress should provide a comfortable level of firmness to almost everybody. Also, if your sleep needs change over time, you can simply flip the mattress to see if the other side suits you better. Less ‘getting lost’: A little like memory foam, the Zenhaven mattress can adapt to the individual shape of your body. However, it is still very supportive. This means that you won’t get the ‘sinking in’ feeling that many people complain about with memory foam. However, you will still get the pin-point pressure relief benefits, making it a great choice for those with back pain. 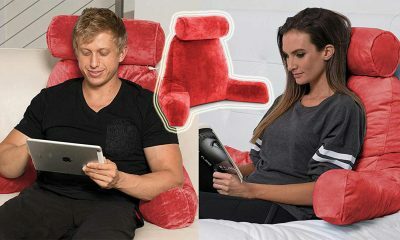 Open cell technology: Open cell technology is a feature specially designed to keep you cool and comfortable at night. It has been designed with air spaces within the construction of the bed. This lets the air move freely throughout the mattress. When air can circulate unhindered, it allows body heat to be released during the night. So, if you often sleep hot, the Zenhaven mattress is well worth considering. This mattress may be a little expensive for some buyers. However, we think you get excellent features for the investment you make. If you’re looking for a natural and eco-friendly mattress, the Plushbeds Botanical Bliss mattress may be what you’ve been looking for. This amazing mattress is made from completely natural materials and has the prestigious GREENGUARD certifications.Therefore, you won’t be exposed to any potential toxins as you sleep. This also makes the mattress much better for the planet. 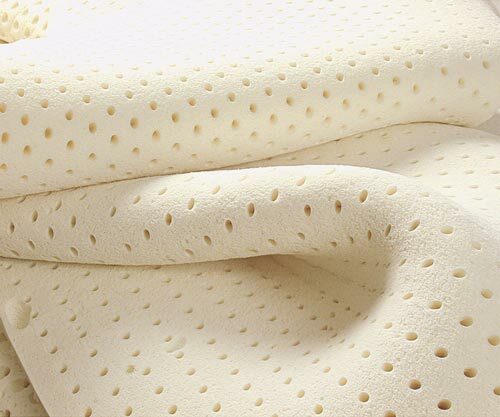 The latex used in this mattress is made using the Talahay mattress. 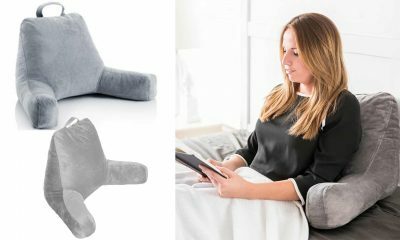 This makes an extremely comfortable sleeping surface that responds to the shape of your body. Therefore, it can gently adapt to your shape and provide excellent pressure relief. So, should you buy a Plushbeds Botanical Bliss Mattress? Read on to find out. GREENGUARD certified: The prestigious GREENGUARD certification assures you that the mattress will not release any toxins into the air as you sleep. Therefore, you can be sure that you won’t be breathing in any gases that could harm your health. The mattress is also hypoallergenic, so it’s a great choice if you tend to suffer from allergies triggered by your bedding. Adjustable comfort: When you first order your mattress, you will select between 3 firmness options. 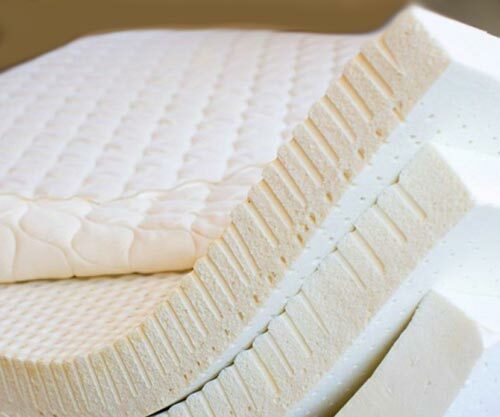 However, if you discover during your trial that your mattress is too soft or too firm, then Plushbeds are happy to ship you an extra layer of latex foam to adapt the level of firmness to your needs. This is an unusual and helpful option that saves you the hassle of ordering a whole new mattress. Certified organic: Organic mattresses are a fantastic choice for many people because they are non-toxic and natural. This also helps the mattress to biodegrade once you’re done with it. Therefore, this mattress is a great choice for your health and for the environment. 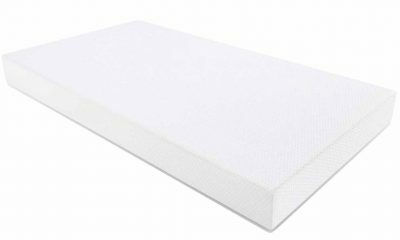 The medium firm Cedar Mattress is crafted from latex foam made using the Dunlop method. It is a hybrid option. 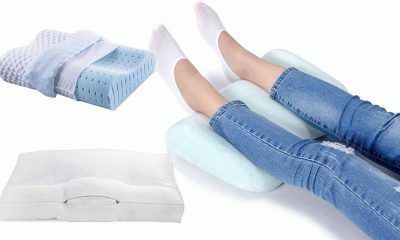 Therefore, it combines the benefit of latex foam with the excellent support of an innerspring core. Therefore, this may be a great option if you are used to the feel of an innerspring but want the pressure relief associated with latex. Furthermore, this mattress is a great choice for those who suffer from back pain because it has zoned support in the lumbar region. Therefore, the mattress can help to relieve back pain as you sleep. Also, you may find that this mattress sleeps cooler than some other mattresses on the market. If you think the Cedar Mattress may be the right choice for you, let’s take a closer look at the key features. Zoned support: This mattress has an extra layer of support in the lumbar region. This helps to give your spine superior support and helps to encourage your spine into a healthier alignment. Therefore, this mattress can be very helpful in relieving and even eradicating back pain during the night. Excellent edge support: The edges of the Cedar Mattress are reinforced to give them extra support. This means that you can sleep right to the edge of the mattress or even sit on the edge without causing any damage. Better edge support helps the mattress to maintain its shape and makes it more durable. Therefore, you can expect a long mattress life with this product. Sleeps cool: Innersprings are already a good choice for people who sleep hot because there are gaps between the springs. This allows air to circulate more easily inside the mattress. Also, the latex component of this mattress has a layer of convoluted foam. This also helps air to flow freely. Therefore, heat can escape from the mattress during the night. So, this should help you to keep cool and comfortable all night long. If you want to select a mattress that does good for others, Nature’s Novel donate money to food banks to help people in need when they sell their mattresses. Also, this mattress s a firmer option than many on our list. This makes it a better option if you sleep on your front or find you need a lot of support to soothe your back pain. This mattress also boasts an amazing lifetime warranty, so you are completely protected if anything goes wrong with your mattress as a result of the workmanship. Nature’s Novel are able to provide such a generous warranty because they are completely confident that their mattresses are highly durable and will stand the test of time. So, if you are looking for a durable and firm mattress, the Nature’s Novel Mattress is well worth considering. Let’s take a more in-depth look at the mattress features. 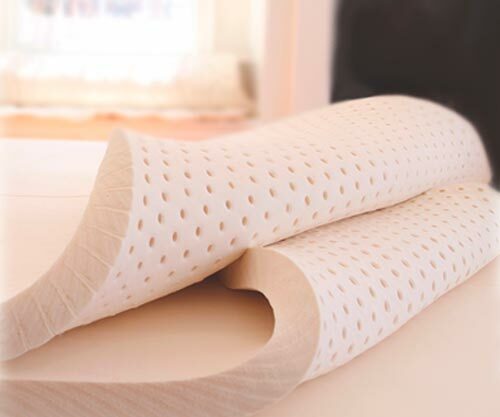 2 layered support: This mattress makes clever use of both types of latex foam. There is a layer of Dunlop-produced foam, which gives a dense and supportive base layer. This is followed by a layer of foam made using the Talahay method. This makes the mattress more responsive to your body shape. The result is a firm mattress that is supportive. However, it is also able to respond to your individual body contours, helping to relieve pressure. This makes the Nature’s Novel mattress a good choice for those with back and joint pain. Open cell technology: Open cell technology creates deliberately-placed gaps in the construction of the mattress. This allows air to circulate more freely throughout the mattress. This helps heat to escape during the night, maintaining a comfortable sleeping temperature. Therefore, this may be helpful if you regularly find yourself overheating during the night. Ideal for stomach and back sleepers: When you sleep on your stomach or back, you need more support than if you sleep on your side. Therefore, you will probably need a firmer mattress like the Nature’s Novel model. 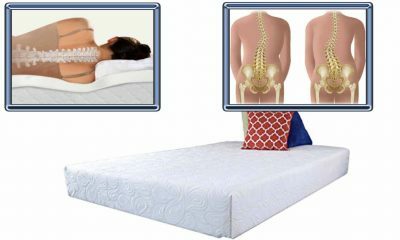 A firm mattress will support your spine very well, placing your spine in a healthier position. So, the Nature’s Novel mattress can also be helpful if you tend to suffer from back pain. 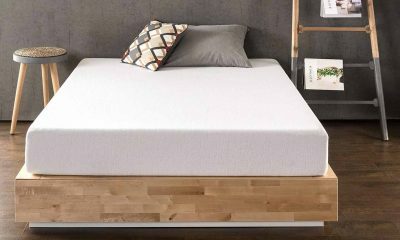 The Nest Bedding Hybrid Latex Mattress is another great option if you are looking for a mattress that combines coil springs with latex foam. 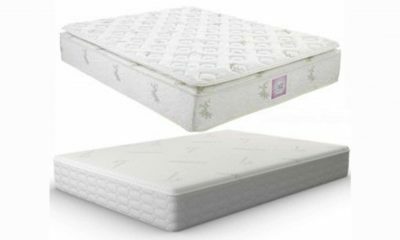 Therefore, you get the support of a spring mattress with the adaptability of latex foam. At Sleep Reports, we think this bed is especially suitable if you share with a partner. That’s because you can add or remove layers to make the bed either medium or firm. As you can select a different firmness for each side of the mattress, this is especially comfortable if you and your partner have different sleeping styles. 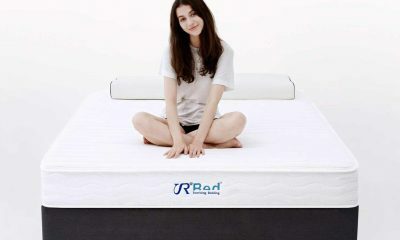 Furthermore, this mattress is very good at regulating temperature and carries the prestigious Certi-Pur certification. So, let’s take a closer look at the features of the Nest Bedding Hybrid latex mattress. Customised firmness: The Nest Bedding mattress allows you to select whether you want a firm or medium mattress. You simply unzip the cover and remove a layer of foam if you want a medium firmness. Furthermore, each partner can select their own firmness for their own side of the bed. Therefore, both of you can have a mattress to suit your needs. So, this mattress is suitable even if you both sleep in completely different positions. 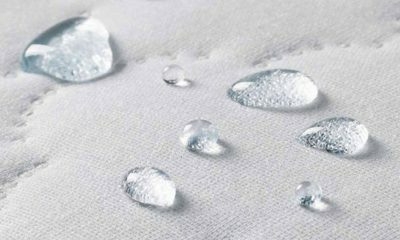 Certi-Pur certified: If you’re concerned about potential toxins in your mattress, then this is a great feature. The Certi-Pur certification process tests products thoroughly to make sure they are manufactured without the use of toxic chemicals or materials. Therefore, this mattress won’t release any harmful gases into the air as you sleep. These could harm your health and the environment. Therefore, you can be sure that this mattress is both safe and healthy. Increased air flow: Because it has a spring core, this creates spaces within the mattress. Therefore, air can flow freely through your bed while you sleep. Also, latex is pretty good at temperature control. When combined, the increased air flow of the core with the temperature control of the latex helps you to stay cool through the night. So, if you sleep hot, this could be a good choice for you. As a relative newcomer to the world of mattresses, Avocado are a company that have grabbed our attention with their great mattresses. The Avocado hybrid mattress is organic and created without the use of any potentially harmful toxins. This makes it a great choice for the environment. However, it is also a great choice for your health because you won’t be breathing in any nasty chemicals during the night. Also, you will love how the Avocado mattress feels to sleep on. It is extremely comfortable and provides a great level of support. 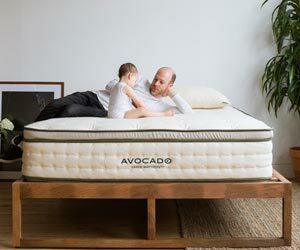 So, why do we love the Avocado mattress so much? Read on to find out. GREENGUARD Gold certified: The Avocado green has been awarded the GREENGUARD Gold certification, which means that it won’t release any nasty chemicals into the environment as you sleep. This makes it a great choice for the planet and for your own health. As you won’t be inhaling any potentially toxic chemicals as you sleep, you can rest assured that this mattress will not have any negative health effects. 3-layered support: This mattress has 3 separate layers, which all perform a different function. The upper layer is crafted from natural wool. Next comes a layer of adaptive latex foam for comfort and pressure relief. Finally, there is an innerspring core to give you great support throughout the night. These features help to encourage your spine into a healthy alignment whilst reducing pressure. Therefore, it is a great choice for both back and joint pain sufferers. Zoned lumbar support: The Avocado Green mattress is created with extra support in your lumbar region. This helps to give your spine extra support and improve its alignment. Therefore, this great feature also helps to relieve and prevent back pain during the night and when you wake up. 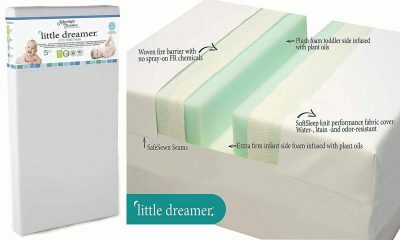 For shoppers on a budget, the Ultimate Dreams Latex Mattress may be a good choice. This mattress allows you to enjoy the benefits of latex foam bedding at a more affordable price. It is made of a layer of high-quality Talahay latex foam which allows it to adapt to the individual curves of your body.Meanwhile, the bottom layer provides a good layer of support. At a medium firmness, this should feel comfortable for most sleepers. So, why do we recommend the Ultimate Dreams Latex Mattress? Read on to find out. Budget friendly: A frequent grumble we hear about latex mattresses is that they’re quite pricey. Therefore, it’s great that the Ultimate Dreams Latex Mattress provides you with an option if you feel you would benefit from latex but are a bit strapped for cash. Therefore, you can enjoy pressure relief and support without the hefty price tag. 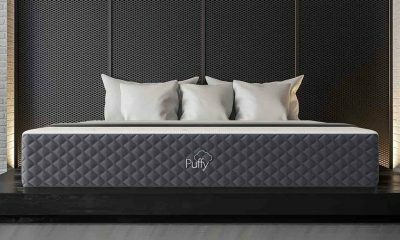 Certi-Pur certified: Even though it is a cheaper option, this mattress has achieved the Certi-Pur certification. Therefore, it’s been manufactured without the use of nasty chemicals that could damage your health or even the environment. So, you can sleep peacefully knowing that you’re not inhaling any chemicals or gases that could pose a risk to your health. 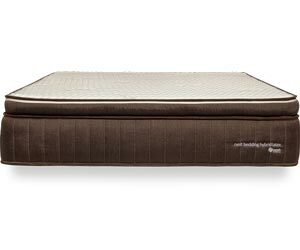 Breathable: The Ultimate Dreams Latex Mattress has a soft and breathable bamboo cover. It also includes a layer of convoluted foam in the base. Therefore, this allows air to flow unhindered through the structure of the mattress. Because the air can flow, this helps excess heat to escape. Therefore, this helps the mattress to remain at a comfortable temperature. So, this is a great choice for people who sleep hot. A latex mattress is any mattress made from natural latex, which is produced from the milky sap of rubber trees. These trees are commonly found in Asia, South America and parts of Africa, and are commercially grown for a variety of uses. One of these uses is to make mattresses. You may be wondering: why use rubber tree sap to make mattresses? Although you may not instantly associate rubber trees or latex with mattresses, it’s actually a great material for making beds. Rubber latex is a natural product. Therefore, it’s a very safe material for human use. Furthermore, rubber latex is a very strong and sturdy substance. When turned into foam for mattresses, it can significantly outlast many other types because of its durable nature. You may be wondering how on earth rubber latex can be turned into a material that’s soft and comfortable to sleep on. The answer is that it is specially processed to turn it into latex foam. In this form, latex is extremely comfortable, supportive and long-lasting. This makes it perfect for making mattresses. There are two separate methods for creating latex foam, the Talahay method and the Dunlop method. Read on to find out a little more about the process. First, the liquid sap is vigorously whisked or ‘whipped’ to create a frothy consistency. This creates the air bubbles necessary to make a comfortable and supportive foam. Next, the whipped, frothy latex is poured into molds. These are placed into a strong vacuum, which has two purposes. It gets rid of any large, unwanted pockets of air so that the texture of the mattress is consistent. Also, it ensures an equal distribution of latex foam throughout the entire mold. After that, the latex is frozen using carbon dioxide. Finally, the foam is vulcanized at a high temperature. This causes it to set and form the familiar foam used for making mattresses. Like in the Talahay method, the liquid latex is whipped into a froth and poured into molds. However, no vacuum is applied during the Dunlop method. The freezing process is not applied in the Dunlop method. Instead, the foam is baked in steam until it sets into a dense and durable foam. Foam made using the Dunlop method is generally firmer and somewhat cheaper than Talahay latex foam. You may be surprised to learn that there are several types of latex mattress. Each type has its own unique properties, and which you choose comes down to your own personal sleep needs. Read on to learn more about the main types. In this type of latex mattress, graphite has been mixed with the latex rubber. Usually, the proportions used are somewhere in the region of 70 percent latex and 30 percent graphite. The most obvious result of this is that the latex foam develops a grey tinge. So, why mix graphite into latex? Usually, graphite is added because it is a fire retardant. However, many mattress companies are now infusing their latex foams with graphite because it can also help to keep a neutral temperature during the night. Therefore, it can be useful if you tend to sleep hot. Graphite latex is often a little firmer than other types of latex foam. Synthetic latex is a man-made alternative to natural latex foam. However, it has a very similar feel and performance to natural latex foam. It’s important to know that a high number of latex mattresses include some synthetic latex in the mixture made to use the foam. This is because it can make the foam more durable, microbe-resistant and can help to make it hypoallergenic. Synthetic latex is a bit firmer than natural latex foam. A natural latex product is mainly made from the natural product of the rubber tree. Most natural latex products contain 80 percent natural and 20 percent synthetic latex. This is because natural latex alone is a little too soft to make a supportive mattress. A product labelled natural latex contains no synthetic latex at all. It must contain at least 90 percent natural latex, with the other part made up of additives to make the foam dense enough to make a comfortable mattress. Most people find that a genuine natural latex mattresses are the most comfortable. Also, this material is highly breathable. This makes it an ideal choice for those who sleep hot or live in very warm climates. However, natural latex products are also more expensive. You should check the product specification carefully to check exactly how much of a ‘natural latex’ mattress is actually made of natural latex. All things ‘hybrid’ are very trendy these days, but in the case of hybrid beds this popularity is generally well-deserved. Hybrid latex mattresses have an outer layer of latex foam. However, they have a core made of a separate material. This is usually pocket springs or traditional coils. This allows you the combined benefits of both a latex and a spring mattress. 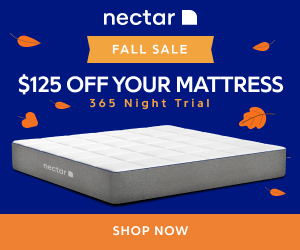 How Do I Choose The Best Latex Mattress? When you’re choosing a good latex mattress, there are several key points to be taken into consideration. Some people find choosing a latex mattress quite difficult because latex mattresses are relatively new to the market. Therefore, there isn’t the same wealth of expert information available about latex mattresses as there is with more common types such as innerspring or memory foam. Don’t worry, because our experts at Sleep Reports know all there is to know about latex mattresses. 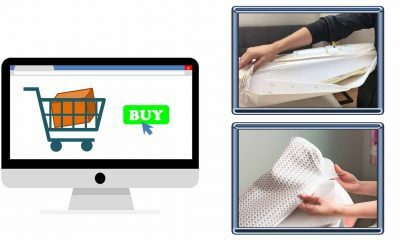 Therefore, read on to demystify the process of purchasing your latex mattress. How is The Mattress Constructed? 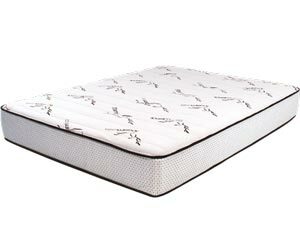 There are several different constructions of latex mattresses available. Some include just one layer, while others have multiple layers of different densities of foam to provide excellent support and comfort. It’s a good idea to try out a few different types in a store to see which feels the most comfortable to your individua tastes. Most latex mattress manufacturers bond their layers together. However, a few brands sell their mattresses with the layers unbonded. This may be worth considering, as it allows you to change the order of the layers to suit you. 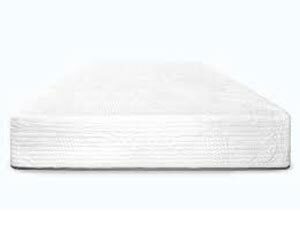 Latex mattress firmness tends to be around the firm to super-firm mark. The firmness of a latex mattress is measured on a scale known as ILD (Indentation Load Deflection). This is decided based on how much force is needed to compress the foam by a quarter. The higher the ILD, the firmer the mattress. The firmness you ultimately go for depends on a couple of factors. First, those with back or joint pain may find they need a medium-firm or firm mattress. This helps to support the joints and encourage your spine into a healthier alignment. Also, your sleeping position comes into play. People who sleep on their sides usually need a soft of a medium firmness. This allows your body to sink comfortably into the mattress. However, back or front sleepers will probably need a firmer mattress to give them the support they need. It’s important to select a mattress with a cover that is both soft and breathable. A soft mattress cover will feel comfy and cosy to sleep on. Also, a breathable material will allow heat to escape more easily during the night, keeping you cool and comfortable. Natural cotton is a good material to look for as it is both comfortable and wicks away excess heat easily. 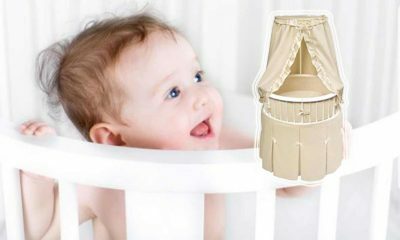 If you opt for natural latex, you can be sure that you are getting a natural and healthy product. Latex mattresses are, generally, more natural options. However, you may want further assurance that your mattress has been manufactured without the use of any harmful chemicals. In that case, there are two main certifications to look out for. The Certi-Pur certification puts products through rigorous tests to ensure that they are not made using toxic chemicals that could harm your health or the environment. Meanwhile, the GREENGUARDcertification checks that products emit very little to no toxic gases into the air. 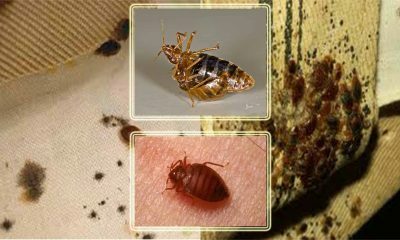 Both these certifications provide great peace of mind that your bedding is safe and healthy. Also, they provide reassurance that the don’t release chemicals that could damage the environment. 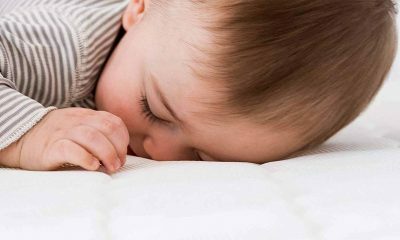 A word to the wise: unfortunately, mattresses are not the only products in our homes that could release potentially hazardous chemicals into the air we breathe. A whole range of products from flooring to paint and many more could pose a risk to your health. If you’re worried, it’s well worth checking out the Greenguard website for lots of great advice for avoiding toxins in the home. Are Latex Mattresses Good For Your Back? If you suffer from back pain, especially at night, you may be wondering if it is caused by your mattress. Also, you may be wondering if a latex mattress could help to alleviate your discomfort. If your back pain is worse at night and in the morning and eases a bit when you get up, then your mattress may well be the culprit. The good news is that a latex mattress can be a great choice if you suffer from back pain. That’s because latex foam is a very supportive material. This helps to encourage your neck and spine into a healthy alignment while you sleep. Therefore, it helps to reduce aches and pains in your back during the night and into the next day. 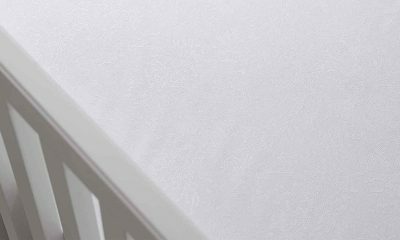 If you’re considering purchasing a latex mattress, it’s important to understand both the benefits they can offer and the potential drawbacks. Therefore, you’ll be able to make an informed decision about whether a latex mattress is the best choice for you. 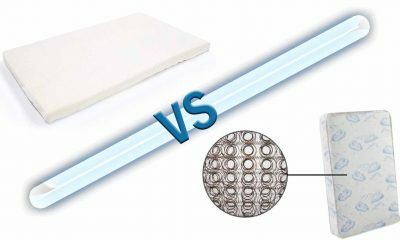 To help you decide, here’s our quick run-down of the advantages and disadvantages of latex mattresses. Durable: Latex is an extremely durable material for making mattresses. A regular mattress has an overall product life of about 7 ½ years, after which it will need to be replaced. However, you can expect a latex mattress to last you up to 12 years if you take good care of the product. Therefore, you’ll get many years of use from your purchase. As mattresses are a major investment, this is a big positive of latex. 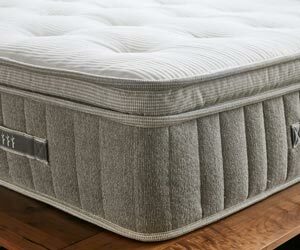 Pressure relief: Excess pressure on joints from sleeping on the wrong mattress can cause aches and pains. It can also exacerbate painful joint conditions such as arthritis. The good news is that latex mattresses are generally more responsive than many other forms of mattress. Therefore, they can conform to your shape a little like memory foam. This reduces pressure on your joints and can help to ease discomfort. Great for back pain: As we mentioned above, latex foam mattresses can be a great choice if you have back pain. That’s because latex offers a very good level of support. This helps to place your back into a healthy alignment, reducing back pain significantly. 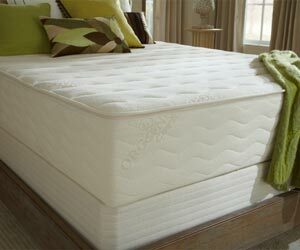 Motion transfer: Latex foam helps to spread your weight evenly across the surface of the mattress. This means that your movements are isolated to the part of the mattress you are lying on. Therefore, your movements can barely be felt from the other side of the mattress. This can be very handy if you or your partner is a restless or active sleeper. very little off-gassing: Some new mattresses, especially those made of memory foam, emit an unpleasant smell when they are first unpacked. This is due to the chemicals used during manufacture. Therefore, it is necessary to air out your new mattress for up to 2 days before you use it. Latex mattresses, however, are made with natural products. Therefore, most people report very little or no off-gassing. Therefore, there is no nasty odour and you can use your new mattress right away. Heavy: Because they are quite dense, latex mattresses are often much heavier than other types. This can be a bit of a pain if you need to move, flip or rotate your mattress. Tricky to find: Latex mattresses are a relatively new innovation in the world of mattresses. Therefore, you may find them hard to track down in a bricks-and-mortar store. However, many large bed and mattress chain stores are recognising the purchase your new mattress online. 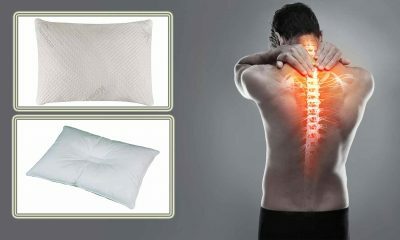 People with back or joint pain: The level of support offered by latex makes it a great choice for back pain sufferers. They also provide great pressure relief, helping to ease joint discomfort. Couples where one partner moves a lot in the night: Latex mattresses are great at limiting motion transfer. Therefore, they can be very useful if you are frequently disturbed by your partner tossing and turning in the night. People who are looking for durability: If you are hoping to buy a mattress that will last you for many years, a latex mattress can be a great purchase. 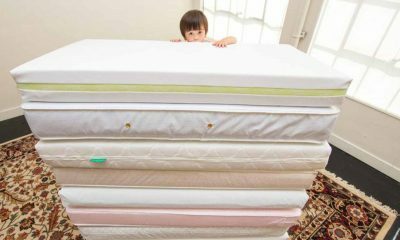 Generally, they can last up to 4 years longer than other types of mattress. Eco-conscious buyers: As latex is a natural product, manufacturing latex mattresses generally has a lower negative impact on the environment than other mattress types. No, not all latex mattresses are necessarily organic. If you want an organic product, check the product specification very carefully. This is because some products may be labelled organic but only have an organic cover, for example. Therefore, you should check that the whole product is certified organic. In general, latex mattresses are more durable than most other mattress types. If you take good care of it, you can expect your latex mattress to last you up to 12 years. yes, latex is a highly sustainable product. That’s because latex can be regularly harvested from the rubber tree without causing it any damage. Not usually. Because latex is a natural material, most users experience very little or no off-gassing when they unwrap their products. Some latex mattresses need to be flipped or rotated regularly to prevent them from sagging. Also, flipping or rotating helps to stop them from wearing unevenly. However, some latex mattresses have a one-sided design. If this is the case, you can only sleep on one side of the mattress. Therefore, it will not need to be flipped at all. Memory foam is made from polyurethane foam, whereas latex foam is made from natural rubber tree sap. In use, latex foam is more firm and supportive than memory foam. Also, it tends to sleep cooler. A latex foam mattress is likely to outlast a memory foam mattress in terms of product life. It shouldn’t be any more difficult to clean a latex mattress than any other type of mattress. However, you may actually find that there is less need to clean a latex mattress. This is because latex has antimicrobial properties. Therefore, bacteria cannot grow as easily on latex as some other mattress materials.